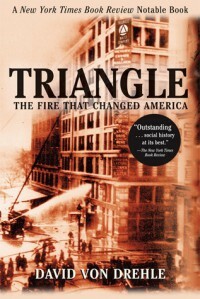 On March 25, 1911, 146 people died at the Triangle Shirtwaist Factory fire in New York City. 6 of them were never identified. Many of those dead died from jumping out of the windows fleeing the fire; jumping seemed better than being burned alive. A woeful lack of fire inspections, fire safety equipment, locked doors, rescue ladders too short to reach upper floors, and other flagrant miscalculations led to the deaths. Unions, still in their infancy, had been striving for better pay & shorter hours, but often, far down the line on their lists of demands was safety. Besides, they still weren’t that effective on getting manufacturers to listen to them. When they called a strike, employers had millions of other immigrant workers eager to fill in as scabs. Cheap manual laborers were a plenty in the early 1900’s. Every day ships were coming in from all over the world and they needed the work. Not to put too fine a point on it, but people were cattle. They were necessary to the manufacturers, but any worker would do. The real problem was society. The workers had no voice because they had no political pull and no money to get that political pull. They. Didn’t. Matter. While everyone was still out for blood, the owners of the Triangle Shirtwaist factory were tried for one of the deaths on the day of the fire. The trial work and evidence was fairly sloppy and they were acquitted. Still, the rest of the workers of New York really reaped the benefits of the changes that the fire started. Stronger unions and stronger laws protecting buildings, owners, & ultimately the workers won. Oh, but at what a price. 146 dead, 6 with no name to this day. This book was interesting because it wasn’t just a play-by-play of the fire. The first portion talks about the strikes in the garment industry just prior to the fire. It sets the stage, you might say, for what they were fighting for and what was to come. Personally, I tend to be anti-union, but this taught me that they did and do have their time and place. They aren’t all about money and better pay, they fight for decency, safety, and a level playing field. If only they had been able to fight a bit longer in the garment worker strikes of 1910 & 1911, 146 people might not have died. If only manufacturers had gotten their money grubbing heads out of the asses a bit faster and stopped treating their workers like cattle, 146 people might not have died. The fire brought on a whole new wave in government called the Progressive Movement. FDR became a progressive at this time and later, his New Deal was a completely Progressive plan. Interesting read, not just about the fire, but the beginning labor struggles in our country. I will warn you, the beginning was a bit slow for me. There was quite a bit of information about the strikes prior to getting into the actual fire. It was important though to see the bigger picture of just how much a catalyst those 146 lives were.